When you are running a business, it is essential to have a grasp of the important metrics which are used to measure performance. These offer you the best way of analyzing the profitability of your business, enabling you to make sensible and informed decisions going forward. EBIT and EBITDA are two of these metrics. But what do they mean? What is the difference between them? How are they calculated and what are the impacts they can have on your business? We have put together this guide to EBIT and EBITDA, telling you everything you need to know and taking the confusion out of these metrics. This will enable you to put them to good use in running your business successfully. EBIT stands for Earnings Before Interest and Taxes. It is the net income of your business before deductions for income tax and interest expenses have been made. It is sometimes referred to as your operating profit or operating earnings. EBIT is an extremely useful metric for analyzing the true profitability of your business as it looks specifically at the earnings you generate from your operations. This gives you a clear picture of how efficiently your business is running and how wisely money is being spent as it only focuses on the costs which you can control. As tax and interest expenses are not within your control, including them can cause some confusion when it comes to working out the profitability of your business. In some respects, your EBIT is a more useful metric than your net income. However, your EBIT is not a figure you need to include in your financial statements. Instead, it is a useful tool which shows you the financial health of your business, letting you know when you need to take corrective action. Calculating EBIT can be extremely useful as long as you know how to interpret the results and understand exactly what they mean. If your EBIT is lower than your net income, this means your business is not generating enough profit. A healthy business should always have an EBIT which is at least equal to its net income, and preferably higher than it. A low EBIT is a clear warning that you need to do some corrective work. So, what can you do if your EBIT is low? You have two options. The most obvious course of action is to reduce your spending. This could mean switching to cheaper suppliers, scaling back your marketing activities, or reducing your overheads in any number of ways. The second option is to find ways to increase your revenue. If you can achieve one or both of these objectives, your EBIT will rise, demonstrating that your business is becoming more profitable. Depreciation – the amount by which the assets belonging to your business reduce in value over time. Amortization – the cost of repayments of debts, such as a fixed payment schedule on a business loan. By accounting for these additional expenses as well as interest and taxes, calculating EBITDA can enable you to focus even more clearly on the actual profitability and performance of your business. It removes all the variables which are not directly related to your operations. This metric is particularly useful for businesses that own a lot of assets or have debts as it enables you to make better projections and plan your future expenditures more wisely. EBITDA is widely used by both investors and business owners as it enables you to compare the profitability of different companies and even different industries. This is because it offers a means of assessing how different businesses manage their debts and the depreciation of their assets. This can be extremely useful for investors trying to choose the right business to invest in. EBITDA can also be used by business owners to normalize business earnings. The business can appear as profitable as possible and future projections can be made more accurately. This can be extremely advantageous when you are trying to attract investment. For example, you can normalize your EBITDA by including non-recurring expenses such as startup costs, repairs, and other one-time expenses such as a product launch. This paints the best possible financial picture of your business. However, investors tend to be aware of the ways businesses can manipulate their EBITDA. It can make them suspicious that you could be making your business look more profitable than it really is. For this reason, an experienced investor will expect you to provide them with other metrics in addition to or instead of your EBITDA, such as your operating cash flow, which also includes working capital and the costs associated with it. Some investors also prefer to use a metric that includes the costs of taxes and interest. This reassures them that your business is trustworthy and reliable, making all the required payments on its loans, and being run legally, fulfilling all its tax obligations. In order to paint a complete picture of the financial health of a business, it is not unusual to use four or five different metrics, possibly more, depending on the nature of your business and how much information investors want to see. EBITDA is only one of these, and due to how easily it can be manipulated, it is not allowed in GAAP (Generally Accepted Accounting Principles) reporting for public companies. However, for small businesses, it can be a useful tool for analyzing the financial wellbeing and security of your business, as well as helping you to plan more effectively for the future. When you need to calculate performance metrics such as EBIT or EBIDTA, it helps to have all the information you need in one place. Otherwise, you can spend a significant amount of time trying to find and analyze a huge number of different documents. This is not a situation you want to find yourself in if you have an important meeting coming up which could secure new investment for your business. Billdu makes it much easier for you to calculate the performance metrics you need as it offers you an ideal starting point by calculating your net income for you. This is thanks to the powerful cloud-based system, which stores all your financial information securely in one place. Every time you make a purchase or receive a payment, this information is processed by the system and integrated into the cloud in the right order, so all the figures you need are at your fingertips whenever you need them. Even better, Billdu enables you to calculate important performance metrics at any time and in any place. Its online software can be accessed from any PC but it also comes with sophisticated mobile apps for iOS and Android. This means you can produce the information you need even when you are away from the office – and even if you choose to change your smartphone, you can still continue to run your business seamlessly. More and more small businesses are turning to Billdu to help make life easier and more streamlined. Billdu takes care of the mundane tasks involved in the day-to-day running of your business, freeing up more of your time so you can concentrate on making your business more profitable. It is also incredibly easy to customize to suit your individual needs. If you would like to find out why our solution is so popular, you can experience it for yourself with a free trial. 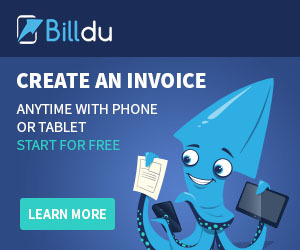 Try Billdu today to start creating professional invoices and tracking your expenses online or via our mobile apps. Have balance instantly calculated and displayed on your Billdu Dashboard. Register for a free trial below now!.